Hundreds of members of Egypt’s Christian minority Copt community gathered at a church in the city of Tanta on Easter Sunday to mourn those killed in a suicide bombing there a week earlier. Islamic State claimed responsibility for the Palm Sunday attack on the church and the bombing of another church in Alexandria on the same day, attacks that killed 45 people in total. Amid heavy security, worshippers filed past a flower-strewn memorial at the Mar Girgis church, with incense burning, and offered prayers. Copts throughout Egypt, where they make up about 10 percent of the population of 92 million, have been attending Easter services in sombre mood following the bombings. The government imposed a three-month state of emergency in the wake of the Palm Sunday attacks, but some in Tanta wondered why the authorities had not acted to prevent the attacks in the first place. But he said authorities had only introduced security measures after the bombing, which killed 27 people at the Tanta church. “Why now? I do not understand,” he said. Coptic Christians, whose church dates back nearly 2,000 years in Egypt, say they have long suffered from persecution but this has got worse since Islamic State started attacking them. 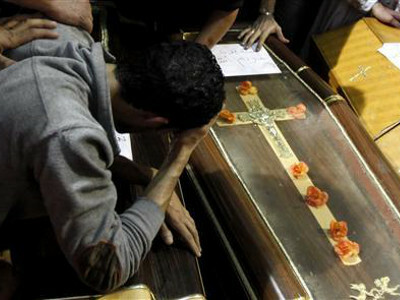 The group claimed responsibility for a church bombing in Cairo in December that killed 25 people. The Coptic Christian Pope, Tawadros, used his Easter message to deliver a sombre message to the faithful after the bombings. “We remember the martyrs of Palm Sunday. With their blood they recorded a new page in the history of Egypt’s Coptic Christian Church,” he said in a video on his website.